Now that PPP-PML (N) coalition has decided to impeach Gen. (Retd.) Pervaiz Musharraf as President of Pakistan, many are raising eyebrows to Mr. Zardari’s designs for this action. The chief spokesman of this school of thought is Barristor Aitzaz Ahson , President Pakistan Supreme Court Bar Association, who believes the impeachment strategy adopted by coalition may not work. We on the other hand have the optimism that democratic forces are now mature enough to ask a beleaguered President call it a day. However, there are others (like Aitzaz Ahson) who have equally logical stance. Unfortunately Mr. Zardari’s past record does prove their viewpoint right; as Mr. Zardari’s somersaults in the past six months are a testimony to maverick’s machiavellian policies which change too often, too sudden. In all probability (whatever may happen to the impeachment or even if it may fail) the Mush’s era is over now. The point to ponder for all democratic minded individuals, groups and parties, however is: while seeking riddance of military dictators, we should not forget the tendencies of strong headed attitudes even amongst our civilian politicians (especially those of a feudal background). The people of Pakistan therefore need to be watchful to ensure that democracy takes a people led course without being tainted, smeared or corrupted by strong headed traits of a military or even a civilian politician. The French Philosopher Rousseau has said “Gratitude is a duty which ought to be paid but none have a right to expect”. While uttering these prophetic words, Rousseau could never have known he was perhaps passing this to Munir Akram a message, a lesson. Meet Munir Akram, the smart, competent, experienced and “smooth as silk” (just as John Bolton termed him) professional, a diplomat par excellence who declared checkmates to many at the UN headquarters. The stallion who lost the race to the disguised face of institutional and political probity, the mastermind who surrendered peacefully to the skeptical system of recruitment and weighing a man’s worth, the staunch defendant who became a victim to the government’s biased preferences and ambiguous interest, the seasoned foreign service officer who paid the price of opinion, who bore the cost of righteous judgment. Rousseau states two major sins (a) expecting gratitude and (b) not offering gratitude. Munir Akram has been found guilty of the latter and the greater one for which no one is forgiven in Pakistan especially if you are a higher official and as a consequence the analogy emerges, ‘In the line of fire’ is to Pervaiz Musharraf what ‘In the line of DISMISSAL’ is to Asif Ali Zardari. Munir Akram, the brilliant orator and writer, was always on the frontline of promoting Pakistan’s interests and its stance. Just as the Russian ambassador said “At the UN you cannot ignore Ambassador Akram if you want to”. The ambassador was recruited after six years of service at the UN’s European offices in Geneva. During his term Pakistani delegation attained invasive influence in every UN body. He presided twice at the Security Council and once at the Economic and Social Council. 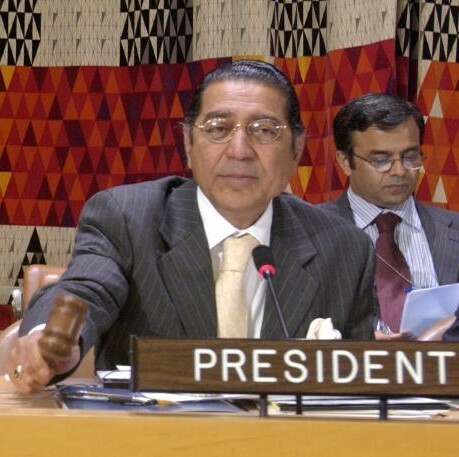 He served as the Chairman of the Group of 77 and the Islamic Conference Group of Ambassadors and also as the Facilitator on UN Administrative Reforms. His greatest achievement remains his attempt par excellence to prevent India, Japan, Germany and Brazil from securing permanent membership in the Security Council. The gentleman is respected globally for his visions, his services and his wisdom, he served us for a long period and we do certainly pay him gratitude. And lo! My dear readers, we dismiss him three years before his term completes and we even take back Zamir Akram’s nomination as the ambassador to Beijing simply because he happens to be Munir’s brother. Bravo! That is what we call homage. That is what we call a solid, merit based decision! That is what we call gratitude…three cheers!!! Socrates famously said “No man undertakes a trade he has not learned, even the meanest, yet everyone thinks himself sufficiently qualified for the hardest of all trades – but not of governance”. The other countries have utilized all of their abilities to prove Socrates wrong yet Pakistan has moved in the opposite manner. To us government is no art, no skill, no hard task. To us it’s simply a game of wealth, a game of power, a game in which victors are born not created or crafted. You win if you are born rich and lucky; you lose if you are not born with a silver spoon in your mouth. I often wonder how we claim to stand amongst the developed and advanced nations. Everyday when a person climbs a ladder in these nations, a person in our country falls from his existing status as well. Each time when a country gets a new government it dreams of a new beginning, but to us it’s all the same, whosoever gets the throne or whosoever loses it. Instead of an improvement the outcomes are only hopeless scenarios, dilemmas, fruitless blame games and the graphs continue to worsen. The only allegation that was put on Munir was denying and disagreeing with the illogical act of sending Benazir Bhutto’s murder case to the UN, first in a routine report and later the more lethal one in a meeting with Zardari. Wait a minute, “disagreeing with Zardari”, does that simplify everything? Does it make you realize why Ambassador Akram was dismissed? Does it put the final missing part of the mysterious puzzle in place? Well unfortunately or fortunately it does. It kind of runs in our blood, right? We all hate disagreement, we hate everybody who stands apart from our opinion and so does Zardari. One of the strongest advocates and practitioners of nepotism, Mr. Asif Ali Zardari is not a complex personality, in fact he just believes in getting rid of whatever he hates. He hated having somebody else head PPP and he got himself in charge. He hated having a huge majority against him and he joined a coalition that has the sparks of disagreement burning every other second. He hates keeping a card up his sleeve once he’s obtained his advantage from it and he’s preparing to impeach President (at least till date!!!) Musharraf. He hates a head that moves from left to right and a hard nose that pokes at every decision of his and to get a head that nods from top to bottom and a wax-made-nose he fired Ambassador Akram and recruited Hussain Haroon in his place. And just in case you are wondering whatever happened to Zamir Akram, it’s just that Zardari hates the fact that only the one responsible be punished so he fired Zamir Akram in the crime of being a brother to Munir Akram. Easy??? Digestible??? Today the question is not of the credibility of the newly appointed ambassador to the UN Mr. Hussain Haroon. He might do a job equally good or (just in case he is luckier than the Akram brothers) even better. The question is on the dismissal of Ambassador Akram, the question is on the future of each and every one of us who stay away from the diplomatic course of action and rather move along the democratic lines of truth and logic. The question is of the future of hundreds of Pakistanis who deserve to be at a place yet a lack of background or solid approach deceives them. It is a question of our today and even more importantly of our tomorrow. Is axing one and appointing another so damn easy? Are we never going to abide by the principles of merit and the country before ourselves? Will decisions based on so called “national interest” and nepotism continue to weaken our foundations and break us? When we give Ambassador Akram the chop, what lessons are we giving to our future generations? Never practice honesty? Don’t ever dare to give an honest judgment or deviate from what the higher ups tell you to do even if it’s wrong? The question is not just of Munir Akram today, it is the question of 16o million people that reside in this country. How do we dare call ourselves independent when we are so insecure? How ironical and mocking is it that our fates are determined by one man who doesn’t even have a legal place in the governing body. No other nation has done it so abruptly before and the Disraeli’s “sudden” theory is enough to cause millions laugh at us again, but every person in this land and on the rest inquires the same, how many more laughs???? you’re stating and the way in which you say it. You make it enjoyable and you still care for to keep it wise. I cant wait to read far more from you. This is actually a wonderful website. Reproductive organ in animals are exclusively for reproduction an remain active in breeding season only , but in case of human being it has evolved to the extent of entertainment and joy and remain active round the year . The sexual insticts are the oldest one ranging from Bacteriophase up to us .These are so intimatly associated with our gene that there are many animal sexual behaviour still being practiced by us such as reproducing like a PIG ? ?